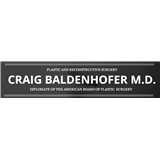 Craig Baldenhofer, MD (New York) - Book Appointment Online! Craig Andrew Baldenhofer M.D. is a Board Certified Plastic Surgeon specializing in aesthetic and reconstructive surgery of the breast, body and face. Dr. Baldenhofer strongly believes in the importance of treating his patients with respect, dignity, compassion and taking the time to make sure they feel informed and heard. Dr. Baldenhofer is skilled in microsurgery including the state of the art perforator flaps for reconstructive breast surgery following mastectomy. These include free TRAM, DIEP, and SIEA flaps. He is trained in advanced techniques of breast and body cosmetic surgery, fat grafting techniques, liposuction and post-bariatric body contouring. *PATIENTS WHO WANT TO COME IN FOR A CONSULT PLEASE TRY YOUR BEST TO FILL OUT THE ONLINE FORM AND PLEASE PROVIDE INSURANCE INFORMATION EVEN IF ITS FOR COSMETIC, THANK YOU. Awesome doctor. Amazing knowledge! Thank you.